Windmill Island Park opened in April 1965 with over 100,000 tickets sold by September 1 of that year. For the next 21 years, the number of visitors averaged over 100,000. The DeZwaan Windmill has undergone restorations several times and continues to sit on Windmill Island, which has become a beautiful hallmark of Holland for visitors and natives alike. The DeZwaan Windmill is currently the only functioning authentic Dutch windmill in the United States and is a symbol of the great pride that the people of Holland take in their heritage. The windmill was originally built in 1761 as a means for grinding wheat in the city of Zaandam, Netherlands, but was moved sometime in the 1880s due to a changing industrial culture. 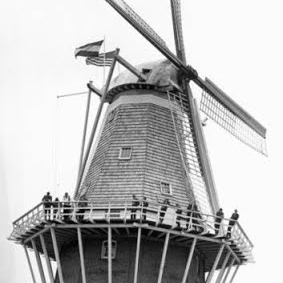 Like most windmills in the Netherlands following World War II, DeZwaan had fallen into a state of disrepair when it was found in 1964 by the City of Holland, Michigan, which received permission to purchase the windmill and began to plan the creation of a Windmill Island Park. Alisa Crawford began working at Windmill Island as an apprentice miller in 2002, and became the first, and only, Dutch-certified miller in the United States. After five years of working in the mill and 18 months of training for certification, Crawford graduated from the Netherlands’ Dutch Mill Society and returned to Holland, Michigan with new skills under her belt and new opportunities open to her. She received journeyman certification from the Netherlands’ Professional Cornmillers Association in 2009. To receive her certification, Crawford learned how to speak Dutch within two years with the help of former Hope College psychology professor Phil Van Eyl. Crawford was one of the only non-Dutch people to be allowed into the milling program. With her training, Crawford was then able to use sails on the DeZwaan Windmill that allow the mill to run more effectively, producing more flour and using less wind than it had before. Today, Crawford continues her work on Windmill Island and awaits master miller status, which she will be able to apply for in 2019. Windmill Island and several other Holland landmarks received national attention in May 2006 when the PBS program “Garden Smart” arrived to get a feel for the history of the tulip and the efforts that the City of Holland goes to to maintain its cultural background. The program visited Windmill Island in addition to Veldheer and Jonkers Gardens, giving the spotlight to the DeZwaan windmill and the Organ House, where music is said to have rung forth on several occasions while filming. With “Garden Smart” covering the gardens of places like Philadelphia, PA, and Orlando, FL, it’s no surprise that Holland was thrilled to show off its most beautiful landmarks—in particular, Windmill Island in the height of tulip season. Named a 2015 winner in The Knot magazine’s Best of Weddings competition for the fifth consecutive year, Windmill Island’s ten-year career as a wedding venue has provided newlyweds and their loved ones with a beautiful setting for ceremonies and receptions. For the past nine years, Windmill Island has provided visitors with an engaging, hands-on approach to learning about the history of Dutch settlement in West Michigan from 1750 to 1840. With reenactors portraying a variety of cultures and educating visitors on their trades, both children and adults alike have the opportunity to look deeper into the lives of those who founded the area that Hollanders today call home. 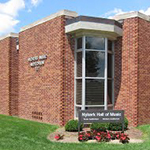 The trade fair usually takes place during the first weekend of May and attracts thousands of visitors, including school groups from around the area who are curious about the history of West Michigan. Chambers, Krista. “Lights, Camera, Tulips.” Holland Sentinel, May 2, 2006. Martinez, Shandra. “History Among the Tulips.” Grand Rapids Press, May 4, 2006. McNichol, Peg. “Fair Trade: Historic Program Opens on Windmill Island.” Holland Sentinel, May 4, 2007. Simmons, Sara. “DeZwaan: The Icon in Our ‘Back Yard'” D.i.s. Magazine 45.4 (2014): 5-7.